This entry was posted in Uncategorized on March 24, 2019 by ccdas. 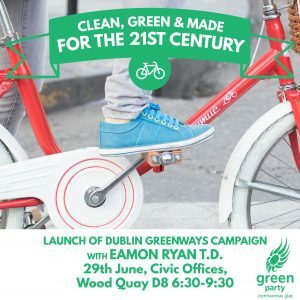 Guest post by Dublin Bay South Green Party member, Billy Jones. I am long term Green Party supporter. By that I mean I have voted many times for the Greens. Since the late 90s I have cycled, walked and occasionally even driven to my local polling station to provide that support. I enjoy the ritual: a quick chat with the staff while collecting my ballot papers, a bit of humming and hawing as I go down the list, but almost always a number 1 for the Green candidate. I have watched RTE’s marathon election coverage expectantly. I have quietly celebrated the party’s successes and lamented its failures. On the 24th of May next, I will navigate the early morning bustle en route to St Brigid’s Primary School. I will write number 1 next to Hazel Chu as the Green Party local election candidate in Pembroke and number 1 next to Ciaran Cuffe as the candidate for the European elections. This time around though, a number 1 vote doesn’t feel like enough. Last year I joined the party I have spent most of my adult life watching from the sidelines. I am belatedly lending a hand. I have leafletted, put up posters and gone to meetings but what has left most of an impression on me is my time canvassing. Aside from joining the masses who campaigned in the final push before last summer’s referendum, I am new to this. I find canvassing daunting but fulfilling, exhausting but ultimately energising. The joys and sorrows of door knocking are perhaps best captured in a book I happen to be reading. That’s according to the novelist Wallace Stegner. It’s true, when we knock on a door, we have no idea what is behind it. We might find a lifelong Green supporter ready to invite us in for tea or a bitter opponent, vowing never to vote for us. We could be greeted by a warm smile and a chat or a grimace from an overworked parent, struggling to get the kids to bed. 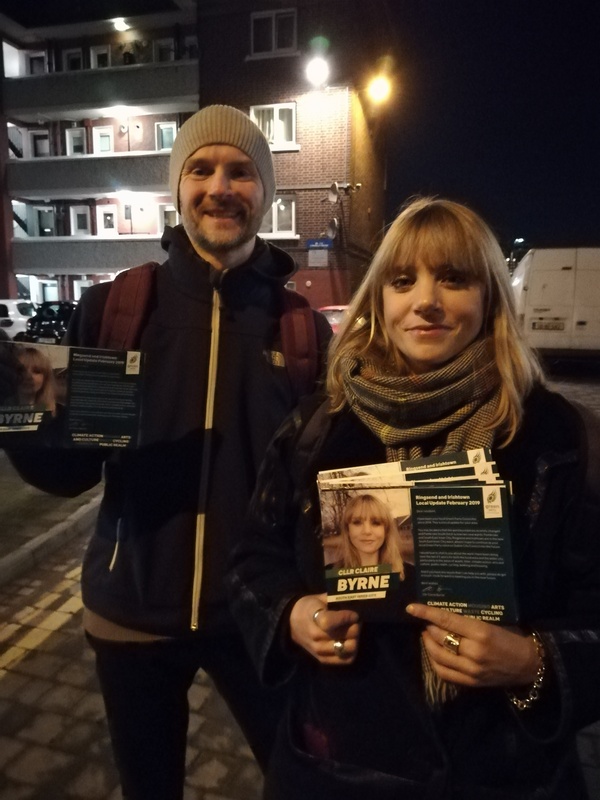 Canvassing is a lottery, it occasionally throws up rude and unpleasant people, but most people are decent and welcoming and many people are genuinely interested. If like me you are new to all of this and you are not sure canvassing is for you, here are a few things to consider. Firstly, you might surprise yourself. I don’t consider myself a natural canvasser, yet I am managing it. I’m pretty good with people but I also find too much time in company tiring. Towards the end of an evening, after innumerable doors and maybe one or two indignant residents I slow down, my capacity for conversation diminishes, I am exhausted. When I get home though, I always have something positive to take away: kind words of support, an interesting take on an issue or maybe just a bit of craic with the other canvassers. This, along with a belief in the ideas we stand for is enough to get me out again the next time. Secondly, I imagine that many of you look around and are frustrated that other people don’t share our views. I know I feel that way. It may sound obvious, but when I started canvassing it was a revelation to me that if you want to win someone over to your way of thinking, you can simply knock on their door and ask them. It is the most direct way of building support and it can be very satisfying. I have found that it is possible to connect with people with different views and even change their minds. More than once I have been greeted with anger and animosity only to see it melt away simply because I listened and was courteous. Finally, canvassing is an opportunity to meet new and interesting people. It can be a lot of fun. In my brief time canvassing I’ve met postwomen, film producers, some very witty elderly people, carers, students and even diplomats (the latter are problematic since they aren’t allowed to vote!). The list goes on. Connecting with people and getting to know them a little can be enlightening and fulfilling. Happily, many of them really do care about issues like climate change, better transport and building a less wasteful economy. If you are reading this, you will most likely be voting Green in next May’s election and those beyond. There are lots of other ways to help and perhaps canvassing isn’t the one for you. However, I wasn’t sure it would suit me, but I am managing just fine. I may even have secured a few more number 1s on the way; perhaps you can too? The voters are out there, we just need to go and get them. This entry was posted in Uncategorized and tagged Canvassing on February 11, 2019 by ccdas. 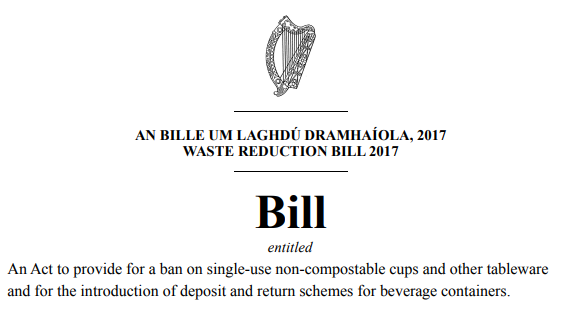 This Tuesday 23 October the Waste Reduction Bill introduced by the Green Party with wide cross party support will be debated. You can take action by signing the Green Party’s petition to demand Minister Richard Bruton supports the Bill – click here. The Friends of the Earth also have a petition that you can submit to your local TD to support the bill – click here. Ireland is the top producer of plastic waste in Europe. In 2015, we generated an estimated total of 282,148 tonnes of plastic packaging waste – the equivalent of nearly 2,000 water bottles or 5,550 disposal coffee cups for every person in Ireland. The most recent EPA statistics show that only 34% of this plastic packaging gets recycled, and according to the National Waste Report 2012 over a quarter of it goes straight to landfill. Introduce a deposit and refund scheme for all beverage containers, including plastic bottles, aluminium cans, glass bottles, and Tetra Paks. 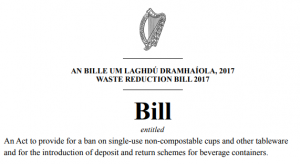 Ban single-use non-compostable cups and tableware and the sale or giveaway of disposable plastic cups, glasses, plates, and other tableware from the 1st January 2020. Read Eamon Ryan’s article in the Sunday Independent on the Waste Reduction Bill here (21 October 2018). Read about how the Government is using a little known provision in the constitution to block Private Members Bills here. This entry was posted in Uncategorized on October 21, 2018 by ccdas. 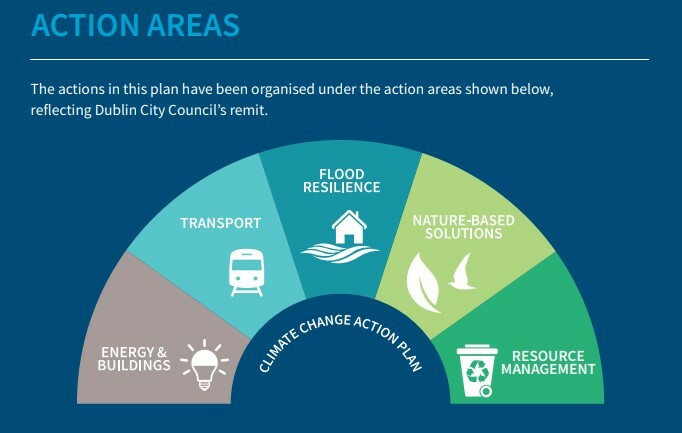 There can be no doubt that the current government lacks vision to lead Ireland in a positive direction when it comes to climate change, housing, transport, supporting carers and protecting our biodiversity. Today, Denis Naughten the Minister responsible for climate change, apart from having to defend another meeting with the only bidder left in the national broadband tender admitted he didn’t request a carbon tax increase in the budget. Below is a video of Eamon Ryan’s speech on Budget 2019 which outlines the shocking lack of vision by the government. This entry was posted in Uncategorized on October 10, 2018 by ccdas. 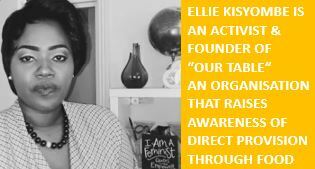 Ellie Kisyombe is an activist and co-founder of Our Table. On Tuesday night the Dubiln Bay South Green Party are hosting a fireside chat with Ellie Kisyombe to discuss direct provision in Ireland, the latest on the right to work, and Ellie’s work with Our Table a charity dedicated to promoting culture through food. This meeting is open to the public. All members are very welcome to attend or pass the invite to a non-member who may wish to attend. So we have a good idea of attendees please book a free ticket using the link below. Thank you! This entry was posted in Uncategorized on February 17, 2018 by ccdas. Tomorrow’s public meeting on Re-imagining Community Development which was due to take place at the Dublin Food Co-op will now take place a 3 minute walk away at The Fumbally Stables, Fumbally Lane, Dublin 8. This is due to a construction accident that has caused the cancellation of events in the Co-Op building. The event will proceed as planned but a little later at 7.30pm at The Fumbally Stables so please come along and have your say on how we can re-imagine community development. Join us on Wednesday 6th December 7:00 p.m. The story of Community Development in Ireland is a compelling tale of what can go right and what has gone wrong in our approach to development in Ireland over the last 30 years. Led by experienced Community Development practitioner Tony O’Grady of Partners (Training for Transformation) and Green Party Leader Eamon Ryan T.D., this interactive meeting will give a brief history of Community Development in Ireland from a practitioner’s perspective, and the key principles and policy areas to consider for the development of resilient and more self-reliant communities. The current centralised model for community development is grossly unbalanced and is undermining the great work of thousands of community groups across Ireland. We want to disrupt this model and build the foundations for a policy that will encourage a more community centric approach to development. We need community leaders and activists to help us to achieve this. We invite you and your organisation to come along and have your say in how you think we can reimagine communities in Ireland and help them grow. This entry was posted in Uncategorized and tagged Community on November 26, 2017 by ccdas. A public meeting will be held on Thursday 29 June 2017 at 6:30pm in the City Wall Space at Wood Quay Venue in Dublin. Now is the time to pressure the government and the Minister for Transport to deliver on this key strategic priority! 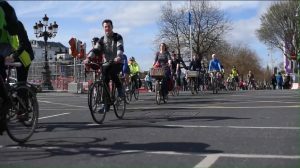 2017 has seen a marked increase in cycling deaths in Ireland. In 2016 the UN criticised Ireland for the poor investment in cycling infrastructure. You can read about the six cycling routes planned for Dublin (three on northside and three on southside) here. The Green Party both in the Dáil and in Dublin City Council will be working to ensure the government increases expenditure on cycling infrastructure and in particular adequately funds these six key cycling greenways projects. We need your help to put the pressure on Minister Ross to deliver these projects! Please come and join us on Thursday 29 June! This entry was posted in Uncategorized on June 24, 2017 by ccdas. You can submit comments here. Dublin City Council are running a consultation on traffic management on the south and north quays to accommodate the roll-out of the Luas cross city. This includes a proposal to remove road traffic on part of the north quays except for public transport, taxis and cyclists. This proposal is a key component of the proposed Liffey Cycleway from Heuston Station to the Point Village. Please take some time to support this proposal. You can submit comments here. Deadline for submissions is Monday 10 April. This entry was posted in Uncategorized on April 7, 2017 by ccdas. This is a guest post by James Nugent a member of Dublin Bay South Green Party who gives his take on youth unemployment in Ireland. In Franz Kafka’s unfinished novel, The Castle, the central protagonist K. attempts to get to a castle to find work. For the duration of this surreal story, K. fails to reach his end goal; the prize of employment. This is in large part due to the bizarre, distant, and alien surroundings he finds himself trapped in. Finding a parallel between a Kafkaesque dystopian novel and a supposedly recovering economy shouldn’t be easy but to this writer’s chagrin, the similarity between the plight faced by K. and the youth of the Republic of Ireland today positively smacked me in the mouth. The major connection, between these two seemingly disparate things, is the lack of help afforded the relevant protagonists in their day to day life aspirations. Now, I know most of this Republic’s youth have a plethora of varying life ambitions they want to fulfil but it is not unfair to say that for a very many of them, the goal of employment is an especially pertinent one. Many of our youth find themselves in an economic mire, travailing hopelessly like K. to locate their employment without success. K. makes appeals to the suffocating multifaceted bureaucratic authority that dominates his everyday enterprise to succeed in his singular ambition, whereas our youth look toward politicians in power, private business, and education for a clear path toward a future inclusive of paid employment. Unfortunately, the receptivity of those they appeal to is askew. Although answers to their plights are provided, they are jarring and unclear. K. is lead around in dementing circles as a consequence of this. The Irish youth comparatively have figured out that aptitude tests, unpaid internships, relatively low pay for their burgeoning collection of degrees, and emigration is the best medicine for a healthy and happier future. At present, our Government is playing two trump cards to reassure our citizenry of a prosperous economic future. The first is our country’s dropping unemployment rate, and the second is her falling national debt. 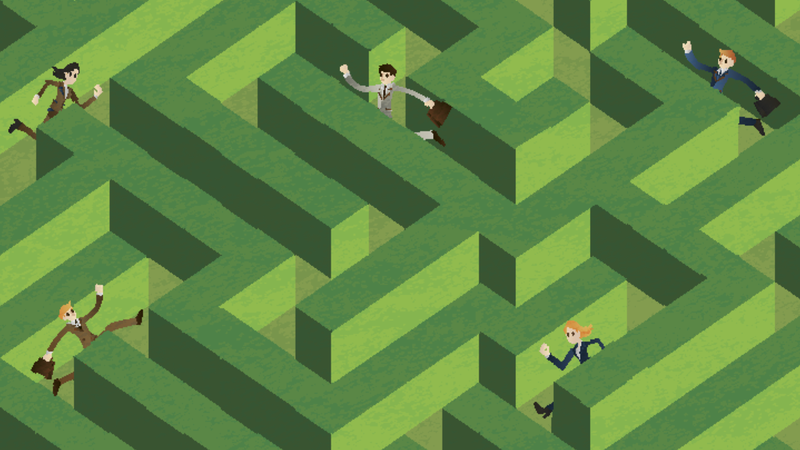 If you were to traverse through the Government’s recent bit-part strategic job plan, you will notice that the only tangible positives are the above. All the rest are futile promises and verbiage designed to obfuscate reality not shape it. Depressingly, when one probes deeper into these positives, their gloss wanes considerably. Recent statistical figures when properly disaggregated are damning for the drop in unemployment. The current seasonally adjusted unemployment rate of 7.1% shows the country has come a long way since the crash but the youth unemployment rate (people aged 15-24) is 15.2% which is very much an outlier in the overall distribution of unemployed persons in this nation1. Adding to this, if one cares to look at the CSO’s recent total population figures, they will see that 194,500 people between the ages of 20-34 left between 2011 and 20162. Granted some of those who left did so voluntarily but for an exodus of this magnitude, the harsh reality is that lots of people gave up on this country as a means to provide a job. Finally, to reinforce this sombre point, the job vacancy rate has stayed consistently below 1% over this period. According to the well-regarded Beveridge Curve prevalent in economic literature, there should be an inverse relationship between unemployment rate and job vacancy. As the number of unemployed goes down, job vacancy rates should increase. Alas, we have a declining unemployment rate and a non-moving job vacancy rate. What is causing this often empirically apparent and valid relationship to fail in our Republic? This writer has a hunch. Unemployed people are leaving because of the lack of vacancies. Such an answer explains away the above failed relationship. Unemployed people leaving equates to lower unemployment rates as the unemployed become a smaller proportion of the country’s populous. The vacancy rate stays depressingly low – In fact according to recent Eurostat evidence, the fifth lowest in the EU. With respect to the lessening national debt, the Government seems to be marching unblinkered to the tune of European austerity, as if it is the only means to slash our financial deficit. Granted austerity has its merits, principally it shows capacity to honour debt repayments, but it has to be administered sparingly to be effective. Economists from Martin Wolf to Paul Krugman have pointedly demonstrated that all out austerity is not an economically desirous circumstance for growth. Our country needs economic impetus to pay off our debt more quickly. There needs to be expansionary policies. There needs to be some sort of debt restructuring. The least our Government can do is provide tangible figures that don’t mask the reality that our nation is in a deep depression at present. We are slouching toward a recovery without direction and leadership. Our youth deserve to have realistic hope for a prosperous economic future. We don’t deserve to live in a Kafkaesque dystopia without any realistic and well thought out resolution. Our democracy is too fragile a flower to survive in such an arid condition. This entry was posted in Uncategorized and tagged unemployment, youth on February 24, 2017 by ccdas. Do you want to influence how our capital city is run? Do you know that Dublin City Council have an online hub where they publish public consultations on plans for our city? Consultations regarding Ringsend and Poolbeg (both in Dublin Bay South constituency) are currently open and we will be posting more information on these consultations in the coming weeks. This entry was posted in Uncategorized on February 9, 2017 by ccdas.